Simultaneously live stream across the most popular social media channels. Reach your audience, No matter where they are watching. 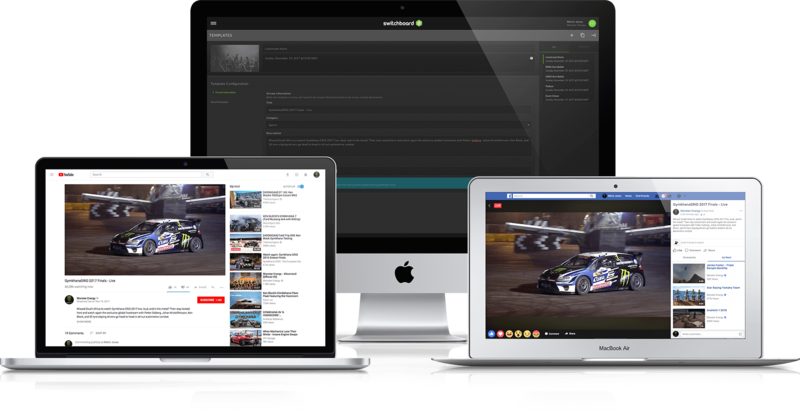 Broadcast your live content across various social sites and streaming destinations. Simultaneously live stream in high quality across various channels + devices. Set it and forget it. Pre-load your social channels + metadata for quick and easy future streaming. Use the encoder of your choice, send streams to custom RTMP destinations, and brand your content with your favorite watermarks. Switchboard Cloud lets you hand-pick the destinations you want to simultaneously stream to, edit stream titles and descriptions, and gather audience insights in real-time. There's so many ways to connect and do more with Switchboard. Here are the benefits of streaming out loud. The total number "Users" you can invite to your Switchboard Cloud Team to use the platform on your behalf. The total number of Destinations you can have simultaneously active is your "included" plus your "add on". "Stream Duration - Per Month" reflects the total number of hours you can stream per month. "Stream Duration - Per Stream" reflects the total number of hours you can simultaneously stream for a single event. We've seen the future of live streaming. © 2019 Switchboard Live Inc.